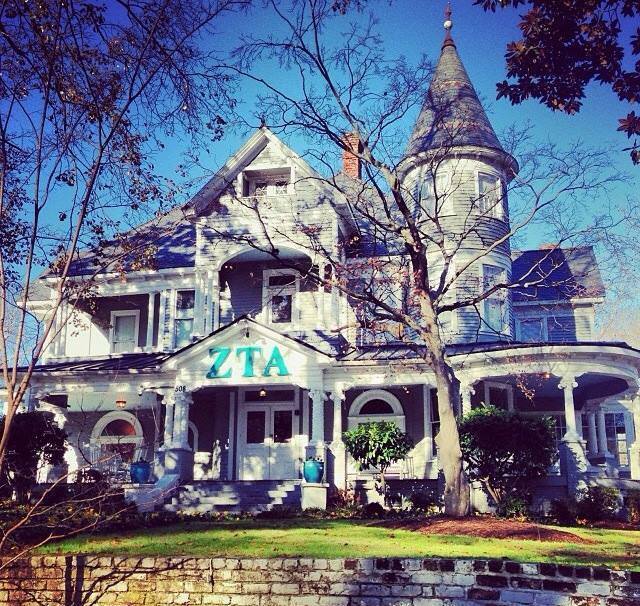 The Iota Rho chapter of Zeta Tau Alpha was founded at East Carolina University in 1987. Our impressive Queen Anne style residence is the most elaborately detailed house of its type remaining in Greenville today. It is the oldest Zeta Tau Alpha house in the nation! Proudly overlooking its terraced grounds and sited amid a mature grove of trees, the E.B Ficklen House inspires reminiscences of a period in Greenville's history when the pulse of its economic development stemmed from its growing tobacco industry and commerce associated with the recently constructed spur line of the Wilmington and Weldon Railroad. Originally dominating a full city block, the Ficklen House, also called Buckingham, borders to the east the main railroad spur line into Greenville, and it once was one of several impressive late nineteenth and early twentieth century homes lining 5th Street, a fashionable residential neighborhood.